Learning design is all about interventions. We are intervening in existing human systems every time we design or present a course. This is not a radical concept, but the process of becoming clear on my own intention changes how I think about the interventions. Take for example an onboarding program for new hires. How does thinking about my intentions for onboarding change my design process? What is different now? Intention: My intention is to align internal resources and messaging to provide a positive onboarding experience for the new hires where they can access and use the tools, resources and people they need to get their jobs done. The new hires should be able to connect previous tools, resources, experiences to their new situations. The people delivering the onboarding experience should understand the messaging and experience they are creating for the interns, as should the people supporting the onboarding. Connection: All the people involved in onboarding, from designers, to support staff, to facilitators should feel more connected to each other in this process. There is a huge diversity of experience and regional differences, and we should learn from each other’s differences. 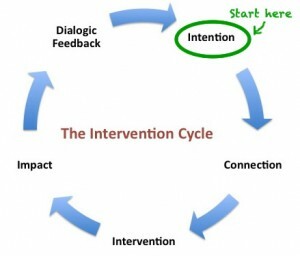 The Intervention: One or two day, in-person event, led by a range of individuals (with differing levels of experience), training them on the expectations, tools, and resources. What was the impact of the learning intervention? All intervention generate useful information regardless of outcomes. Feedback – compare the desired impact to the actual feedback. How sound and current is your data? Ego Management – is the intervention based on the needs of the system as well as your own? What are the needs of your client? Don’t let ego issues distract from the goal of building relationships towards their critical mass. Will this actually change the effectiveness my work as a learning designer? I think at the very least being aware of my ego issues and my intentions has already begun this change process. And thinking about all the human systems at play in this large complex project, of which I am just one piece. Tagged with broom, cycle, intention, intervention. Ego management is an issue, true – especially with people who are payed to be the center of attention! For me, its always been an interaction of my philosophy/desires, the client(sponsor) and the client (participant). Aligning these three is one of the biggest challenges in the work, IMO. My default reaction has been to minimize my own place, because I won’t be dealing with the consequences as intimately as the other two parties. However, I think this makes my professional brand less memorable than I would like. FYI – I (re)started blogging again. I shifted to an easier management site to use and am putting out thoughts on design, games for learning, social network analysis. It should be at brassringinc.com by the end of the day.